Attention. Attention. The Ram 1500 is all-new for 2019. It’s been fully redesigned from top to bottom. So, what’s new? The Ram has shed some weight as lighter metals replace those in non-vital panels and systems, even while stronger, heavier steel finds its way into the Ram. As a result, the Ram 1500 is both lighter and stronger than its predecessors. 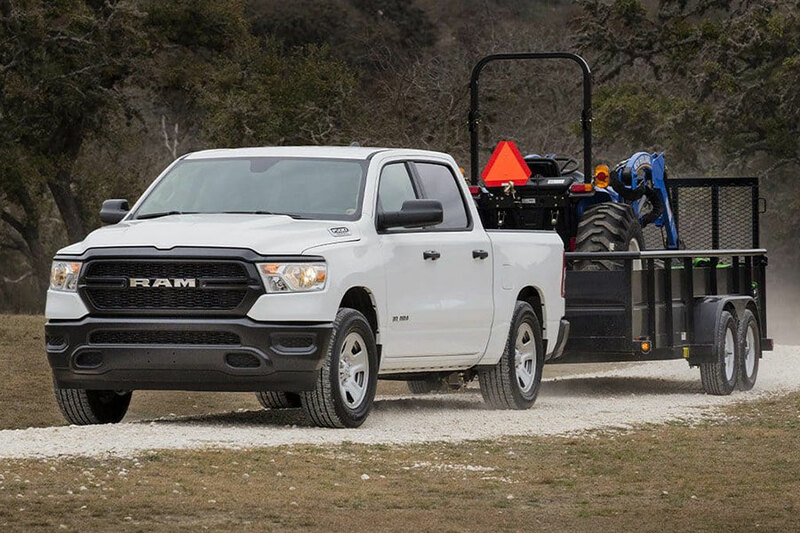 On top of that, the Ram can now tow and haul more than ever before. (More on that later.) Finally, there’s a new mild hybrid power system. This system, called eTorque, helps the automatic engine stop-start system work more smoothly and delivers great bursts of speed at the drop of a hat. How does the Ram 1500 compare? Let’s pair it to the rival-worthy Toyota Tacoma and see how it pans out. That’s the goal of this comparison guide, coming at you right now. The all-new Ram 1500 is a foot or more (depending on configuration) longer than the 2019 Toyota Tacoma. The Ram is also wider and taller. That size difference puts the Ram 1500 in an entirely different class than the Tacoma. Yet, and here’s the point, the Ram’s starting price is only six thousand more than the Tacoma’s base model. The Ram 1500 Tradesman goes for $31,795, whereas the Tacoma SR is priced to sell at $25,555. 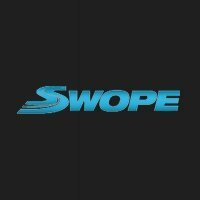 Keep those prices in mind as we step through the rest of these categories. Obviously, the Ram and Tacoma being in separate classes of truck, this isn’t exactly a fair comparison. But let’s see what all that extra towing and hauling power is worth to you. 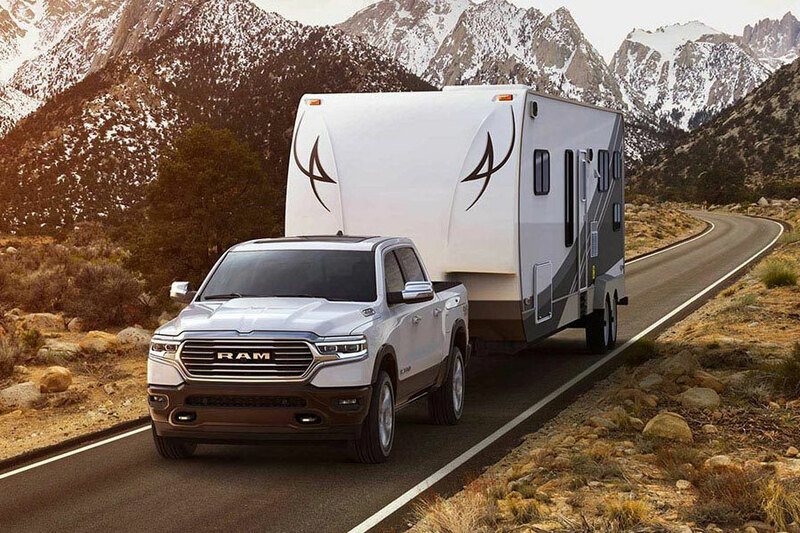 The 2019 Ram 1500 can tow up to 12,750 pounds. Its payload capacity is 2,300 pounds. We may not need to tell you, but these are higher than the Tacoma’s. They are some of the highest in the Ram’s class of full-size trucks. On the other hand, the Toyota Tacoma hauls up to 1,620 pounds and can tow up to 6,800 pounds, when properly equipped. That’s almost half the towing power of the Ram 1500. That means that with the Tacoma, small recreational boats and small hard-side RVs are fine, but you’ll need something like a Ram if you have a larger boats, camping trailers, or car-hauling box trailers. What is that work and play potential worth? Besides weight, another consideration is just dimensions. Cargo space can affect what you can carry as well, sometimes by quite a bit. The Ram 1500 has a 6-foot-4-inch or 5-foot-7-inch bed, depending on cab configuration. Compare that to the Toyota Tacoma, which has a choice of 5-foot or 6-foot-1-inch beds, and you can see the difference. There are some things that just won’t fit in the Tacoma. To top it off, the Ram 1500 can seat six, while the Tacoma seats only five. How much is that extra room worth to you? We have not yet touched on the other advantages with the Ram, which also outshines the Tacoma in horsepower and torque, feature options, and more. You might pay more up front for the Ram 1500, but it pays you back in work output in short order.